Look what Modern Alice just gave us! And who is Modern Alice? She is one of our fave bloggers who writes about a variety of fun things, but it is her food blogs – scrumptious treats made with everyday ingredients – that get us drooling. We eat the raspberries in other people’s gardens. If you grow raspberries, be warned: We always help ourselves, even if we’ve been told that The Raspberries Are For Jam. We have a fat goldfish, and we mean fat. On-the-verge-of-exploding fat. There used to be four goldfish in our aquarium, but the other three mysteriously vanished. We own an authentic Soviet Army standard issue winter hat. It’s probably the warmest hat ever made; you really can’t bear it on your head for more than 40 seconds. We are unable to grow proper flowers. Flowers dislike us and we try not to think about it. We’ve learned to squish spiders with our bare hands. No flyswatter or tissue or shoe. Hand + Spider = Squish. We are not proud of this skill. 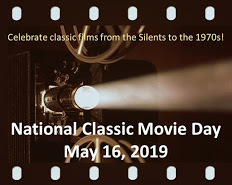 We don’t ever plan to review the movie Casablanca, even though we’ve seen it 93 times. 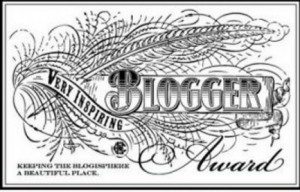 We are supposed to nominate other bloggers for this award, but most of the excellent blogs we follow have already been nominated. So we will forego that idea for now, until we think up our own Blog Awards. Your list of seven things was a positive scream. Now I can call it a day. Congrats on your much-deserved award! Hahahaha!! I love the 7 things. Congratulations, you ARE very inspiring!